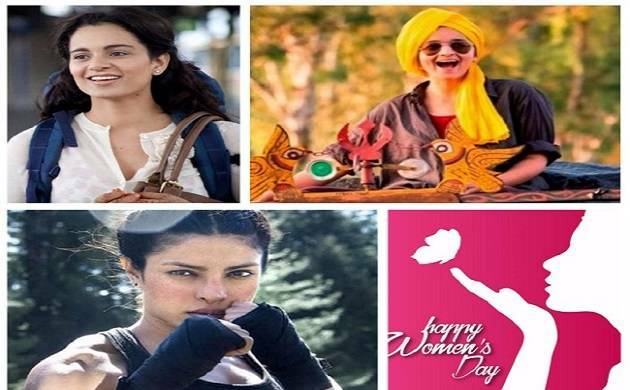 On the special occasion of women's day, the issue of women empowerment has been one of the most prominent genres in movies. In a women's day special presentation we bring you top 8 Bollywood songs which cherish women courage and freedom. The world is celebrating International Women's Day on March 8 and even Google has dedicated a doodle to honour and respect women's role in the society.This year, the theme of International Women's Day is #BeBoldForChange. Among the many different ways to celebrate the special day, we bring you the best of Bollywood songs in Women's Day special presentation which celebrates women- their freedom, their courage, power and talent. Bollywood has experienced a number of motivational and inspirational songs featuring leading ladies of the industry in the likes of Priyanka Chopra, Deepika Padukone, Kangana Ranaut, Alia Bhatt and others. Over the course of time, the issue of women empowerment has been one of the most prominent genres in movies. Apart from that, their are songs which celebrate women contribution and empowers them. 'Jugni' from the 2013 blockbuster Queen is a beautiful track sung by Amit Trivedi explores the carefree nature of women. The popular track, 'Badal Pe Paon Hai' from Shah Rukh Khan-starrer Chak De India features how a woman can achieve any dream if they collectively aim anything. You cannot take your eyes off from this bubbly and bindaas performance of Alia Bhatt in 'Pataka Guddi' from Highway. Composed by A.R Rahman, Pataka Guddi is sung by Nooran Sisters - Sultana and Jyoti Nooran. The 'PINK Anthem', sung by Jonita Gandhi with rap by EPR Iyer! is a beautiful song which encourages female courage and enthusiasm. The most soulful song from a truly inspiring film 'Neerja', Jeetay Hai Chal encourage the spirit of women to live more, enjoy more and cherish the life more.Neerja" stars Sonam Kapoor & Shabana Azmi. The 2014 Indian crime thriller, that deals with the problem of human trafficking in India features this beautiful song explores the eternal power of women and can anytime boost anybody's courage. Starring Priyanka Chopra in & as Mary Kom, this fast-beat, pumping song is a true motivator. Down with disappointment, listen to this song and you will be cheered up instantly. The song features Mary Kom's struggle and fight back as a true women inspiration. This beautiful song sung by versatile Sona Mohapatra is one offbeat song which will definitely encourage you to be fearless. Depicting the power, courage and the capabilities of women, Bekauff is a must watch.